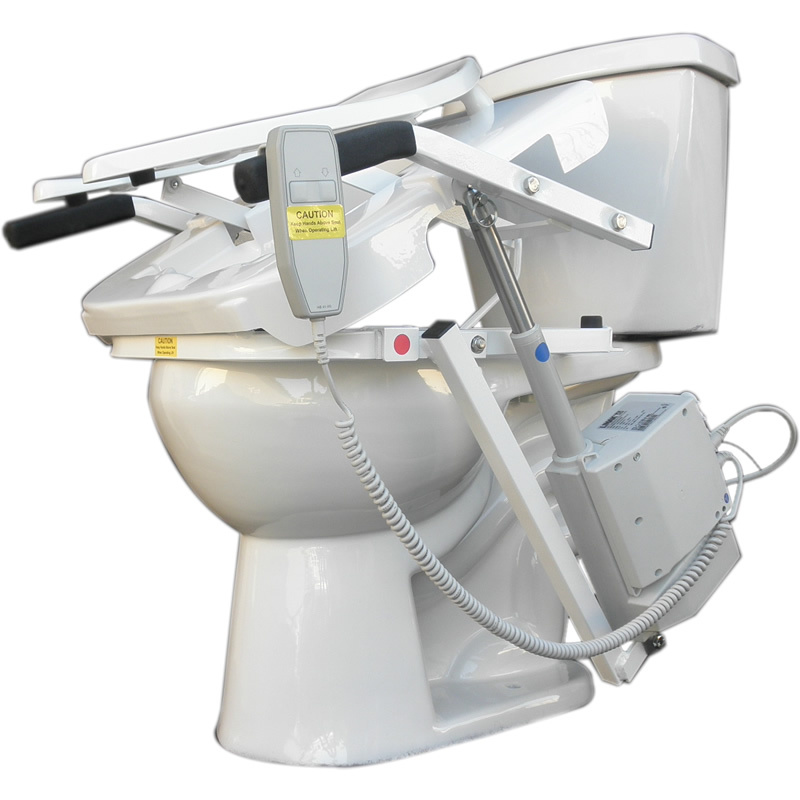 The Tush Push Toilet Chair Lift restores independence in the bathroom and quality of life for persons with limited mobility. 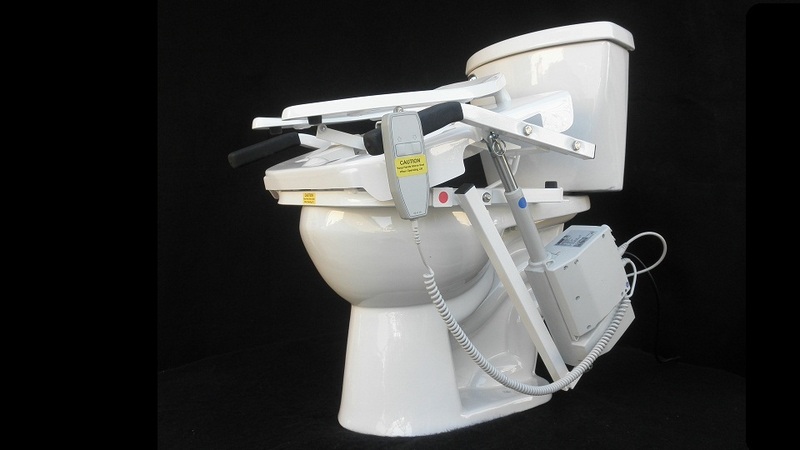 It is a one-of-a-kind, electric Toilet Chair Lift that safely lifts and lowers a person with the push of a button. 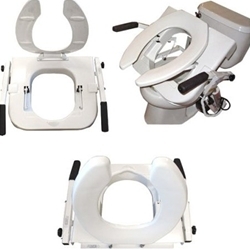 If you have a lift chair in the living room, then it makes sense to have a Tush Push in the bathroom. Lift Help is critical in the bathroom because it can be a more dangerous and slippery room than other areas of the home. Because of the weakening of the muscles in the legs, patients with Amyotrophic Lateral Sclerosis (ALS) -- also called Lou Gehrig's Disease -- and Inflammatory Muscle Disease (IMD) have found the Tush Push to be especially helpful in restoring independence. The Tush Push is a strong, dependable machine whose design has been carefully perfected over the years. It reproduces the natural body movement of standing up by gently lifting and pushing forward at the same time. 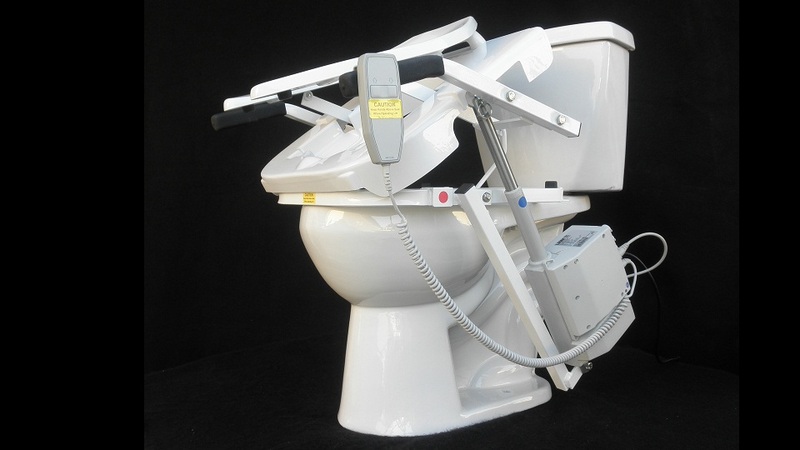 The Tush Push is designed to be compatible with the vast majority of toilets, including standard and ADA toilets. To fit in the space around the toilet, it only needs 13 inches of clearance on each side of the bowl, measuring from the center of the bowl outwards. 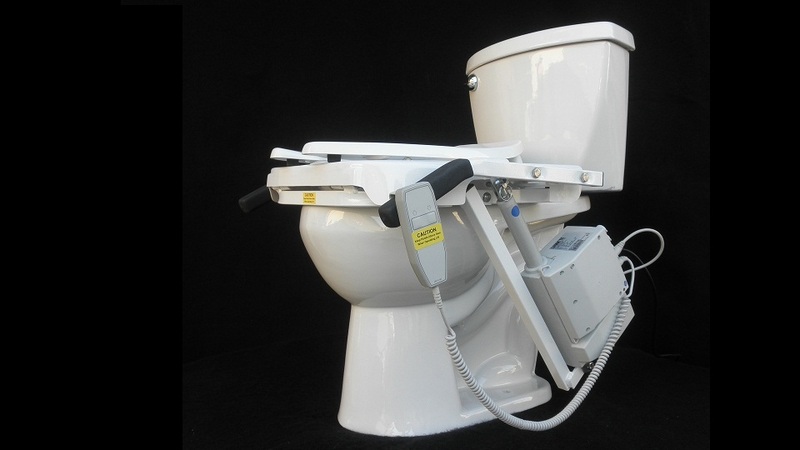 The Tush Push Lift installs easily by screwing into the holes that already exist in the toilet. When in place, the Tush Push replaces the old toilet seat. Because it is remarkably light for a mechanical lift, the device is portable and can be taken on vacation or when visiting family. Every Tush Push includes a powerful motor that plugs into the wall. A model with two motors is available for patients of 350 pounds or more. 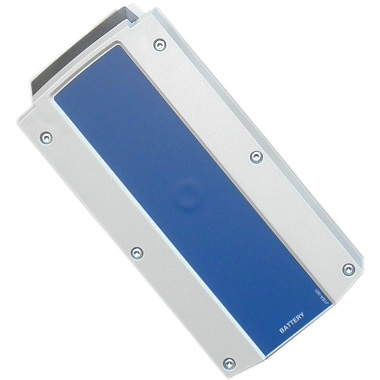 Optional backup batteries are also available to ensure operation during power blackouts. The batteries recharge while the lift is plugged in and include an LCD battery charge indicator that lets you know when they're low on power. 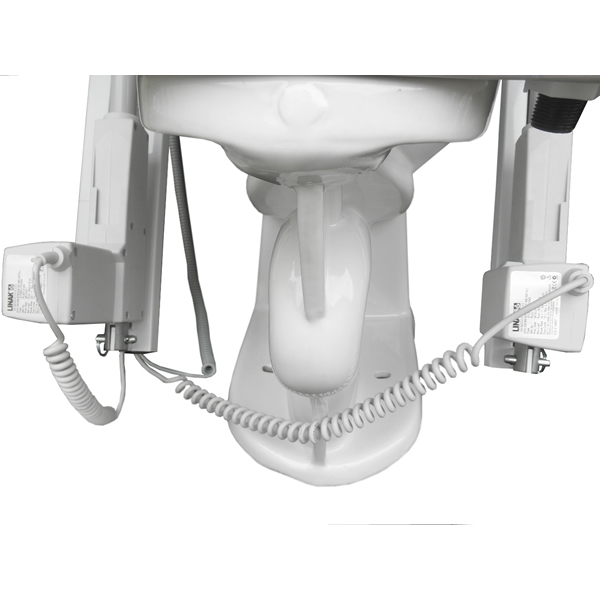 The lift comes standard with safety grab bars. The bars are designed to automatically rise to the proper height of the user. In the down position, the bars are lower than the seat to facilitate a slide board transfer. Optional desk style arms are also available when additional arm support is desired. The optional elongated seat is for people who prefer a little extra support underneath. However, because of the lifting action of the Tush Push, elongated seats are only recommended for persons 5 feet 10 inches tall or taller. The elongated seat has an open front. The standard seat has a round, closed front. Remember, the Tush Push can be modified to fit non-standard toilet seats. Just give us a call to arrange for custom bracket holes to be installed in your machine. This device can also be modified to fit larger persons. The standard model is 24 inches wide with 20 1/2 inches between the grab bars. When special ordered, the width between the seat arms can be expanded up to 36 inches to accommodate wider people. If you or the person for whom you are shopping has any other customization need, call us at 1-866-868-9694. We will work with Phillips Lift Systems to customize your Tush Push.. Optional Elongated Seat - Add $34. Optional Desk Chair Type SINGLE - Add $95. Optional Desk Chair Type DOUBLE - Add $190.